If you are a small business seeking the best possible website to capture search engine traffic, we can make it happen. Visit our Cool Jazz Web Design Studio site to learn more. We will help you assess your needs and create a website for you, tweak the website you have, or consult with you on the changes you can make to improve your existing site (while staying well within your budget). Effective SEO (Search Engine Optimization) and SEM (Search Engine Marketing) require more than merely throwing up a site — any site — on the Internet. A performance website is not about “tricks” or programs you can run to “beat” the system and effective websites don’t just happen — they are built — just like your business. You need to understand the nuances of great page design, how to build in great opportunities for organic search through carefully crafted web content, and intuitive site navigation. 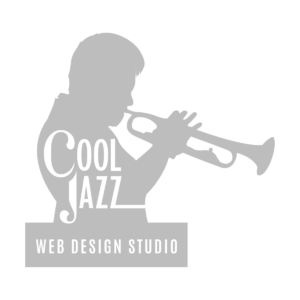 Cool Jazz Web Design & Marketing focuses on making your business visible online. Cool Jazz Web Design Studio is the joint venture of two online digital media pros. Danville Computer Doc’s programming and technology guru, Steve Knight, works in tandem with veteran website copywriter and marketing consultant Angela Allen of WickedWriter.com to insure your CoolJazzWebDesign.com site provides the programming, data structure and content to improve your website’s ranking in Google and other major search engines. Learn more about these partners. Excellent, effective website design is more than just what you or your visitors can see — It requires “backend” considerations including: utilizing clean code, ensuring your web pages load quickly, keeping sitemaps updated, proper metatags, graphics that render in both desktop and mobile formats, security measures and regular updates., organic SEO targeted content and a team that stays up-to-date on this fast-paced and ever-changing industry. These are probably not the types of things you want to do yourself (or entrust to a hobbyist or someone just starting to learn website basics), but they ARE essential to your online success. Let the Danville Kentucky Website Professionals keep your site in tip-top shape and help you establish and grow your online presence while you are busy growing and running your business. Give Cool Jazz Web Design & Marketing a call: 859-935-1984 to discuss your website needs today, or visit us online at CoolJazzWebDesign.com.